Speed: Selling your car to a dealer is the fastest way to get paid. Dealerships love buying and adding pre-owned vehicles to their lots because about 70% of annual vehicle sales are used cars. A trip to your dealer to sell a used car (or trade it in) usually won’t take more than an afternoon, leaving you with cash in your pocket by the time 5 PM rolls around. Selling it privately may take weeks or months—if you’re able to find a buyer at all. Convenience: Drive into your dealership, make the sale, and go home—how much easier can it get? Unlike private sales, you won’t have to align your schedule with the dealer’s, deal with “no-shows,” worry about crime, or waste time posting ads and emailing prospective buyers just to get money for your car. Simplicity: Don’t mess with paperwork when selling your car! Dealers will handle all the paperwork for you and the BMV, so you won’t have to worry about anything other than the price and signing your name. With a third party or private buyer, you’ll have to deal with all title transfers and bill of sales. Trust: If you choose to sell your car at a dealership, once all terms are agreed upon and contracts are signed, you’ll no longer be responsible for the vehicle—so long as you weren’t attempting to deceive. With private parties, you may be liable for any vehicle problems; should the buyer become angry, they may file a lawsuit or even attempt to collect their payment in other unsavory ways. Private buyers may also attempt to scam you by paying in counterfeit bills, fraudulent third-party checks, or fake money orders. Potential Tax Break: If you decide to sell your car as a trade-in—we highly recommend that option—some states may even deduct tax from the total price of the new car in the amount of your trade-in. For instance, if you trade in a car for $5,000 and purchase a new vehicle for $20,000, you may only have to pay taxes on $15,000. Tax credits may also be available for select new vehicles, including EVs and PHEVs. Higher Payouts: Unfortunately, dealerships are businesses and, as such, are only able to operate by making money. Dealers pay wholesale prices when they buy pre-owned vehicles, and oftentimes those prices are lower than what you’d get when selling to a private buyer. More Money for Older Cars: Older vehicles—particularly those with more than 100,000 miles on the odometer—aren’t as highly sought-after, meaning dealers could have difficulty finding a buyer. Should they fail to find a buyer, that vehicle may be sold at an auction. This means they may “low-ball” you when negotiating on price. With private buyers, you have the power to set a price. Easy to Post Ads: While it’s not entirely simple to find someone to pay you top dollar for your vehicle, it’s a breeze to post advertisements. Third-party sites like Craigslist, Auto Trader, Cars.com, and others put you in the driver’s seat to make a sale. Learning Opportunity: It may be more difficult to sell your car privately, but you’re more likely to gain some knowledge about the process along the way. If you plan on selling cars at a regular clip, you’ll want to start with a few small-time used car sales first. Better Deals for Buyers: Selling your car to a private party is a win-win. Not only are you getting more money, but they’re often paying less money than they’d otherwise spend at a dealership. Dealers price their used cars at retail value, and you can use this knowledge to price your car somewhere between wholesale and retail value to help land a sale. 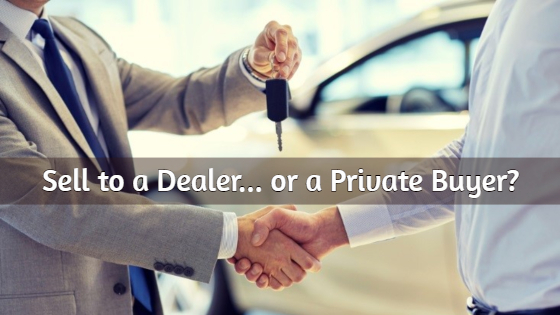 Should You Sell Your Car Privately or at a Dealership? It’s the million-dollar question with no correct answer. Of course, selling your vehicle to a dealer is the easiest route to take, especially if you have no history with private sales. On the other hand, you’ll probably get more money by selling your car to a private party. Ultimately what it comes down to is how much time and effort you want to put into selling that vehicle. If you’d rather just get everything done and over with, contact your dealership. If you’d like extra money back in your pocket and you don’t mind more legwork, a private buyer is the way to go.